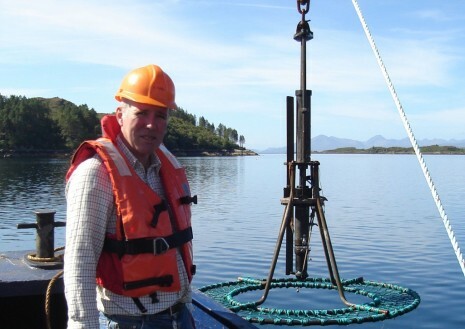 In 22 years of research on the Marine Environment, Professor Kenny Black has built a reputation as one of the world’s leading experts on the interaction between salmon farming and the environment. He’s published 61 peer reviewed journal papers, been awarded over 50 research grants, edited six books on environmental aspects of aquaculture and co-ordinated six European Union projects concerning the impacts of aquaculture. Now he’s helping usher in a new era of salmon farming in the Marlborough Sounds. “The future of salmon farming in the Marlborough Sounds comes down to whether there is room for expansion in terms of environmental impacts and the concerns of local people,” he said. “Salmon can be farmed sustainably – they have really good qualities compared to all other livestock animals. They grow fast, they’re relatively easy to grow and they are a great product. The Scottish Institute of Marine Science Principal Investigator in Marine Ecology, Prof Black was brought to New Zealand late last year by the Marlborough District Council as they worked with New Zealand King Salmon and key community and industry stakeholders to develop new guidelines to steer future salmon farming in the Marlborough Sounds. According to MDC Environment Committee Chairman Peter Jerram, Prof Black provided key independent expert advice during several workshops that served as the first step to building better working relationships and more certainty for all parties. “What we’re trying to organise are agreements on best salmon farm management practices that would ensure the environment is safe and the industry is well managed,” Cr Jerram said. A positive side effect of the process was that it provided concerned citizens a chance to ask Prof Black directly about their fears. “I met some people who were genuinely upset, in tears, at what they perceive to be the threat of expansion,” Prof Black said. It was also a chance to dispel myths. “Then there were other people I met who basically had a poor understanding or were exaggerating impacts,” he said. “There were a few people who felt adding a few more farms was going to environmentally devastate it (the sounds environment). I can’t share their view on that. “They are genuinely terrified of the damage they think will happen with what I would regard as a modest increase in the number of farms. I don’t know where they get it from. “I think some people have probably been influenced from others who are very negative about the industry in principle. “However he was quick to point out there were still some environmental unknowns that needed to be considered. “Salmon farms (in the Sounds) are very few and are not using very much space, but it’s not just about space. The other aspect of salmon farming is its nutrient impact. “There is excellent work being done by NIWA at the moment in developing a model that will answer the question of how much farming can the Sounds take in terms of nitrogen and primary production. “This is a key question that needs to be answered for the future of the industry. How sensitive are the Sounds? However, it’s clear that farming salmon in New Zealand carries a host of environmental advantages above international salmon farmers. “What stands out the most is the environment you’re operating in New Zealand compared with the environment most salmon farmers are facing in the rest of the world,” Prof Black said. “The impacts and interactions with the environment are very few. “The main impacts in Scotland are the impacts of sea-lice and the interaction with wild fish populations. “None of these issues are important in New Zealand. You have no lice and no native salmon. Prof Black may not agree with all industry opponents- but he does sympathise with them. “I don’t believe a modest increase in Salmon farming in the Sounds will have a catastrophic impact but I genuinely sympathise with people who do. “Whether the fears are accurate or not is not the issue in the first instance – if people are very upset about fish farming , then time and effort needs to be spent with these people.Interestingly, Prof Black himself might have provided the first step in the process of repairing community rifts created during NZKS’s application to the EPA for new farms. “It (the EPA process) was a divisive, horrible process. It was political…people’s integrity got attacked and it was unpleasant for all involved,” Cr Jerram said. “This (the workshops) was a deliberate effort to move things forward…it’s a good start. “I don’t think we’ve come to a final agreement, but had some pretty mature input coming from us all sitting together in the one room and talking it through. “To work collaboratively we’re going to need a greater degree of trust and respect between all those with a stake in this process.”Prof Black agreed it was a positive first step. “Shortly there will be a decision on the four NZKS sites (currently before the Supreme Court),” Prof Black said. “If they get these sites, that would provide a lot of new tonnage and by the time they become operational, we will have the work from NIWA and will be able to look at the Sounds and see if there is more scope for expansion or moving around sites or converting mussel farms.